Credit cards have become an indispensable part of your life making it easier to transact purchases that are essential to your daily routine, and they beat the risk of carrying around huge wads of cash. Like everything else in life, credit cards, if used improperly, can cause irreparable damage. Learning to manage cards properly while preserving and improving your credit rating is a must. The magnetic strip on the reverse of your card contains sensitive information in a coded format, and routine physical handling can wear off the strip and create problems. Never drop the cards loosely in your pocket and instead carry them safely in paper, plastic or vinyl card holders the bank provides, or insert them in your wallet. To prevent identity theft always use secured websites that have money transactions encrypted for safety. Studiously avoid entering your credit card number, bank account number, and your name and address in unsecured sites that may be sharing your sensitive information with undesirable users. How do you know whether a site is secured? Simple. It will be indicated as an https instead of the regular http in the URL of the site, and this can be confirmed immediately as you land on the home page. An added precaution is transacting reputed sites like Amazon and eBay. If you are unsure regarding security many sites enlist third parties for affecting E-payments, and PayPal and Google Checkout are reliable options. Your credit card operates under a drawing power approved by the provider, and this is the maximum amount that you can draw for purchases. To the extent possible you should carry out purchases while keeping credit card balances well within the approved drawing limits. While it is tempting to max out your card limit it would be wise to plan purchases so you don’t overdraw the approved limit at any time. Try keeping purchases to bare essentials that can be repaid in the interest free period to prevent interest accumulation on the balance. Unless you actually utilize the credit component and show how you can handle payments, your credit score will not move. It is best to restrict spending to 30% of your credit card limit at all times. Always have a repayment program in place to repay credit balances, and staying within the 30% limit will leave you sufficient cash for emergency payments. Remember that your credit utilization compared to your available spending power (limit) is an important ratio that boosts your credit rating if it is handled sensibly. Be punctual in meeting payment deadlines, and keep your checking account topped up to facilitate quick payments. Review statements periodically for accounting mistakes or charges erroneously debited that, if left undetected, can spoil your credit report and rating. If you are sure that a certain level of purchases will always be charged monthly to your card, it would be prudent to set up an automated payment system for releasing payments from your checking account every month. This will ensure you don’t incur unnecessary debt. This is also responsible borrowing. 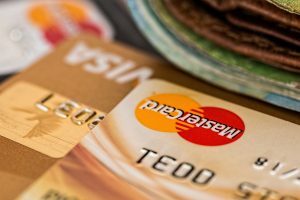 No matter how careful you might be in using a credit card, it will become increasingly difficult to control expenditure as you tackle life’s unceasing demands. Your income may also fluctuate drastically in a recession hit economy. Limited spending power and strained debt servicing capacity may cause card balances to swell. The problem becomes compounded if you maintain multiple card balances. If your credit card outstandings have risen to uncontrollable heights that threaten your financial stability it may be time to avail a loan for vehicle title. Pawn car title loans are indispensable for consolidating unsecured balances. Availing a cash loan for title at interest rates below 25% APR, and having an extended repayment schedule on par with bank loans, will give you immediate relief from high interest credit cards. Auto collateral loans are easy to get, and all you need is a loan free title to your own car that will instantaneously deliver cash up to 60% of your vehicle’s worth.